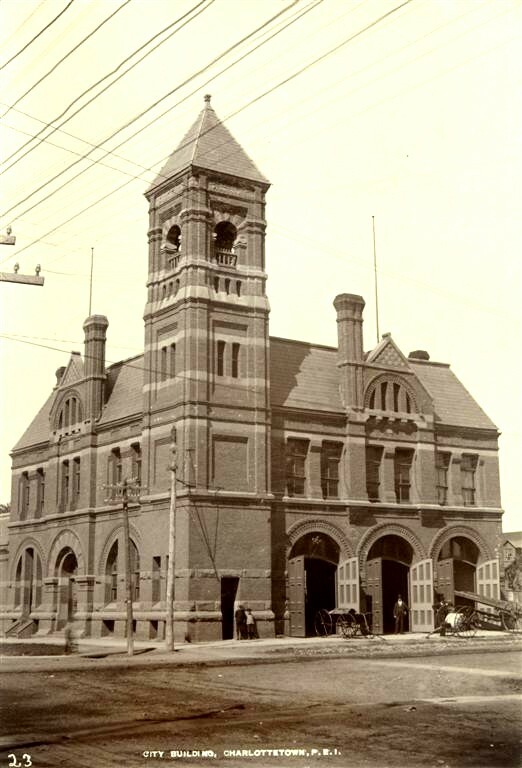 City Hall was constructed in 1888 on the site of Love’s Tannery. 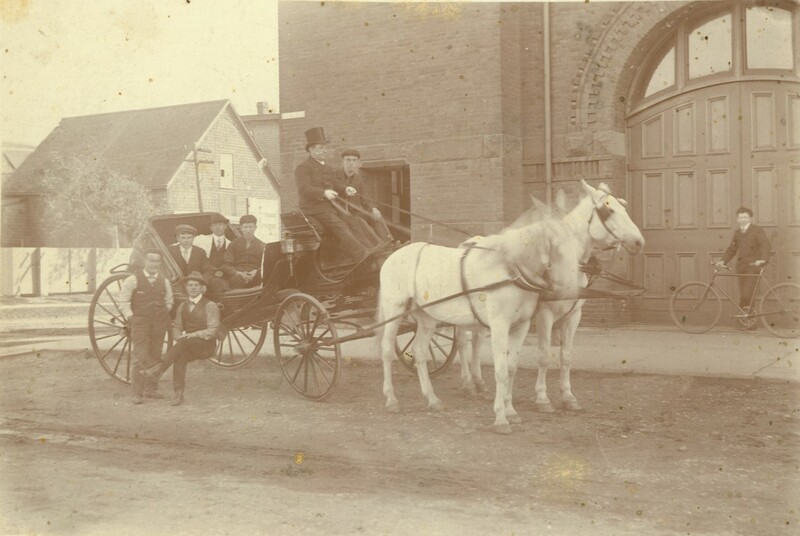 Although the City was incorporated in 1855, Council met in private homes, a former courthouse and later, the Butcher Market on Queen Square. 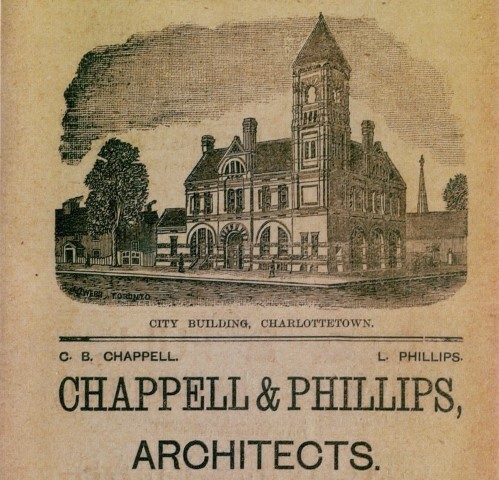 A handsome building befitting the growing City, prominent architectural firm Chappell and Phillips were hired to design it and William H. Fraser would build, along with some of the finest craftsmen in the City. 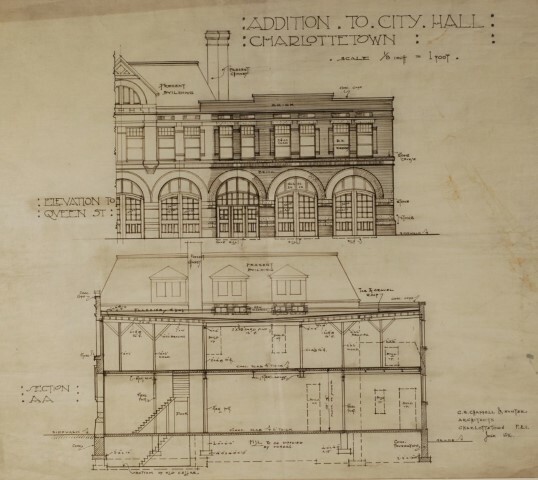 In the early days, City Hall housed the Mayor’s Office, Council Chambers, the City Clerk, the Stipendiary Court, the Police Department complete with cells, as well as the Fire Department, complete with its horses and engines! Bursting at the seams, a large addition destined for the north side of the building was designed in 1916 by Chappell and Hunter, but would not be built until 1931. The fate of City Hall was uncertain when fire inspectors called the building a “fire trap” in the 1950s and 1960s. Happily, it was decided to restore, instead of destroy, the beautiful landmark. It has undergone a number of upgrades since. A National Historic Site, City Hall is a treasure both locally and nationally. Historically significant not only for the decisions affecting the fate of the capital that are regularly made inside its walls; the building has hosted countless visiting politicians, diplomats, military heroes and royalty. City Hall is the only 19th century building left on this block. Further up Queen Street, the Rashed Family’s popular Town and Country Restaurant (opened in 1965) served the downtown until 2006 and was demolished in 2009. The modern Ceridian Building at 223 Queen Street is on the site of what was once the home of A.N. Large, Fire Chief of Charlottetown and business owner. 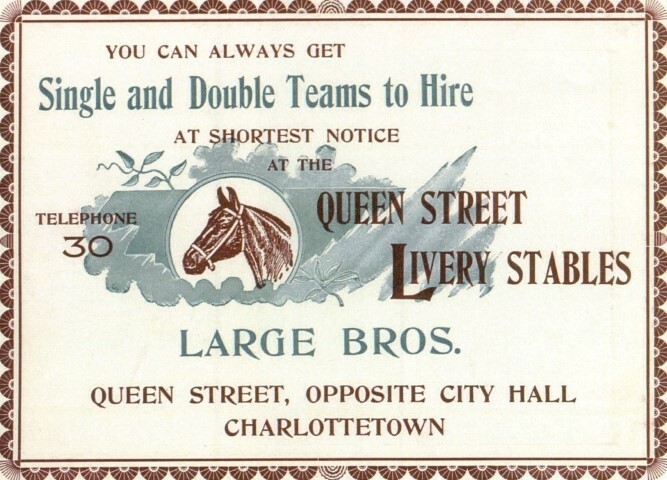 It is also where the Queen Street Meat Market originally operated from, before moving to University Avenue. The second oldest building on this section of Queen Street is the Island Telephone Company (built in 1930) on the south west corner of Queen Street and Fitzroy Street. Interestingly, the east side of this section of Queen Street near the corner of Fitzroy Street once played host to the Circus that was in town when the Fathers of Confederation visited us in 1864. Later in the 20th century, two fine houses, one of which garnered a Heritage Award from the City of Charlottetown in 2010 for its sympathetic restoration, were constructed. Further south on the site of the City Water Department garage and a service station, the Queen Parkade was built in 1979. It has the honour of being the City’s first parkade. On the north east corner of Queen and Kent Streets, only steps from both his home and workplace, A.N. Large, did a grand business with his livery stable, billiard room and general store. A more modern building was constructed on the site that served at least two financial institutions and is now a Canada Post location with office space on the second floor.